Read the Toyota iQ (2009 - ) car review by Auto Trader's motoring experts, covering price, specification, running costs, practicality, safety and how it drives. The Toyota iQ is a freshly styled and uniquely packaged city car that's distinctly cool. However, it's not the best car to drive and the high list prices are off-putting – especially when cheaper cars are more talented. Plenty of standard equipment, even on base iQ. Sub-100g/km CO2 emisisons and average economy of almost 65mpg. Far too expensive to recommend. Interested in buying a Toyota iQ? Mini. ). Beyond that, it’s also very handsome, with every model coming with alloy wheels, body-coloured bumpers and mirrors. The iQ2 adds darkened bi-halogen headlamps, front fog lamps and chrome rear light inserts, but any owner can also personalise their car with a whole host of options, including exterior graphics, extra chrome detailing and different alloy wheel designs. 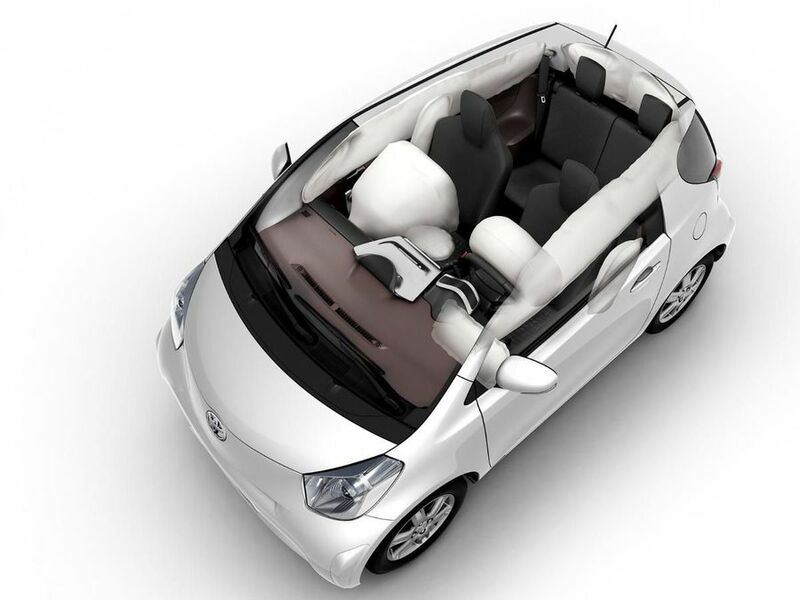 Toyota is marketing the iQ as a premium product, which is reflected inside the cabin. Attractive, high-quality materials adorn the dashboard and interior trim, including leather trim on the gear lever and steering wheel. As with the exterior, the interior can also be personalised with options such as custom leather trim, carpet mats and chrome sill guards. The cabin is wider and taller than you might expect, so it really does feel roomy, and the driving position is improved by every model having a height-adjustable driver’s seat. However, things would be better if the wheel adjusted for reach as well as height. The iQ’s four seats are arranged in a unique manner; rather than being a full four-seater, the iQ is more like a 3+1. The front passenger seat sits further forwards than the driver’s seat, which allows an adult passenger to sit behind the front passenger. And while it’s true that the iQ will take three adults, the space behind the driver’s seat is much more limited: even a child could find it cramped. With all the seats occupied, the boot is tiny, capable of taking just 32 litres. If you drop the 50/50 split rear seats, you get 242 litres of space, which is good by city car standards, but we found the best compromise was to think of the iQ as a three-seater, with room for luggage behind the driver’s seat. It’s impressive for a car that’s less than three metres long, but other city cars are much more practical, able to take four and some luggage. The iQ’s natural stamping ground will be within the city limits, where it’s a very zippy little thing. Its small size and tight turning circle allow it to thread its way through congested streets very easily. Unfortunately, the ride is a little bit on the choppy side, so you’ll feel plenty of the road surface. Things get less impressive out of town, where the body leans over quite a bit in bends and the skinny tyres run out of grip earlier than you expect. Motorway journeys can be a rather hairy experience, too, because the iQ is susceptible to side winds. The iQ offers a choice of two engines: go for one of the two lower trim levels and you get a three-cylinder 1.0-litre petrol unit, but the top trim level comes with a stronger 1.3-litre engine. The three-cylinder unit has plenty of character, thanks to the off-beat noise it makes, but around town it feels genuinely nippy, and quicker than you might expect of such a small engine. The larger engine is stronger still, but both expose their limits out of town, and while a motorway cruise is possible, the engine noise never dies away completely. Compared to similarly sized rivals, the iQ is pretty expensive to buy – even when you take into account Toyota’s assertion that it is a premium product. On the other hand, once you’ve bought it, an iQ should be cheap to run, especially if you choose the 1.0-litre engine. With a manual gearbox, this averages more than 60mpg and emits 99g/km of CO2, making it exempt from vehicle excise duty. We’d avoid the automatic gearbox because of its negative impact on both fuel consumption and CO2 emissions. The same goes for the larger 1.3-litre engine – not just because it’s less economical, but also because it’s in a higher group for insurance. Toyota has made a selling point out of the excellent reliability of its cars and the iQ does nothing to harm the company’s reputation. It feels extremely well built and our own owner reviews are almost uniform in their praise of its quality and reliability. In addition, there’s always the reassurance of Toyota’s five-year/100,000-mile warranty. You might expect such a small car to force you to sacrifice safety, but not a bit of it. The iQ achieved a five-star score in Euro NCAP crash tests, scoring 91% for adult occupant safety. Its standard equipment is also very impressive, with no less than nine airbags fitted to every model, along with stability control, anti-lock brakes and Electronic Brake Distribution. Toyota bills the iQ as a premium product and the good news is that the standard equipment reflects that. Every version comes with 15-inch alloy wheels, air-conditioning, electrically adjustable and heated door mirrors, remote central locking, auto-dimming rear mirror, leather steering wheel, six-speaker CD, Radio, aux-in for an MP3 player, steering wheel audio controls, electric windows and tinted glass. The iQ2 adds a high gloss finish to the alloy wheels, climate control, folding door mirrors, keyless entry and start, automatic headlamps and wipers and chrome rear light cluster trims. The big difference with range-topping iQ3 trim is that it has the larger 1.33-litre engine and larger alloys, while leather seats and satellite navigation are further options. If you want a really small car that can cut a dash in the city, the Toyota iQ is a very attractive choice. You’ll pay handsomely to buy it, though.